Summary: Despite recent technological advances in Brain-Computer Interfaces, we continue to struggle with acquiring high-resolution (spatial and temporal) deep brain neural activity patterns. Making sense of the measured data regarding its correlation to the higher-level cognitive processes is an even bigger challenge. The author of this study proposes a standardized invasive in vivo method for (a) extracting and (b) decoding deep brain neural dynamics using multielectrode array implants. Based on neuroplasticity, the method would enforce neural conditioning, which would decode and convey neural correlates’ activities onto the multielectrode array pins. 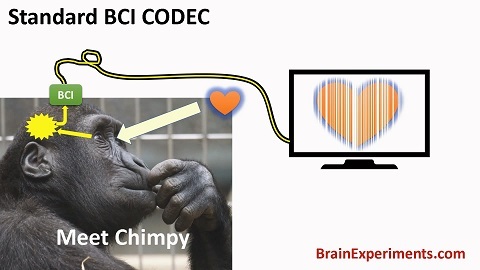 Applied inversely, it would allow encoding and eliciting desired sensations in the subject’s brain. A simple unsupervised recurrent neural network model is built to demonstrate the method. This study is theoretical, and an experimental animal trial is proposed to test the demonstrated method. Summary: Consonance is a perception phenomenon that evokes pleasant feelings when listening to complex sounds. Since Pythagoras, people have attempted to explain consonance and dissonance, using diverse methodological means, with limited success and without providing convincing underlying causes. 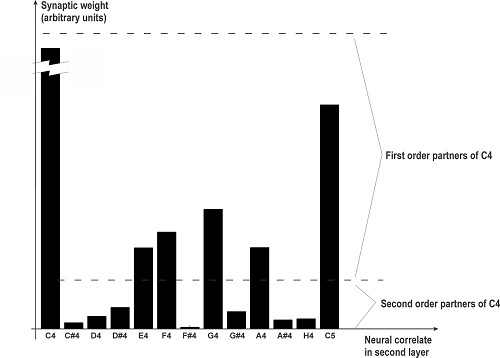 We demonstrate that a specific auditory spectral distribution caused by non-linearities, as a first phenomenon, and the Hebbian neuroplasticity as a second, are sufficient set of phenomena a system should possess in order to generate the consonance pattern — the actual two-tone interval list ordered by consonance. The emergence of this pattern is explained in a step-by-step manner, utilizing an artificial neural network model. In an reverse engineering manner, our simulations are testing all the possible spectral distributions of auditory stimuli (within particular precision scales and applying certain abstractions) and reveal those that produce a result with a pattern perfectly matching the consonance ordered two-tone interval list, the one that is widely accepted in the Western musical culture. The results of this study suggest that the consonance pattern should be an expected outcome in any system containing the asserted set of phenomena. 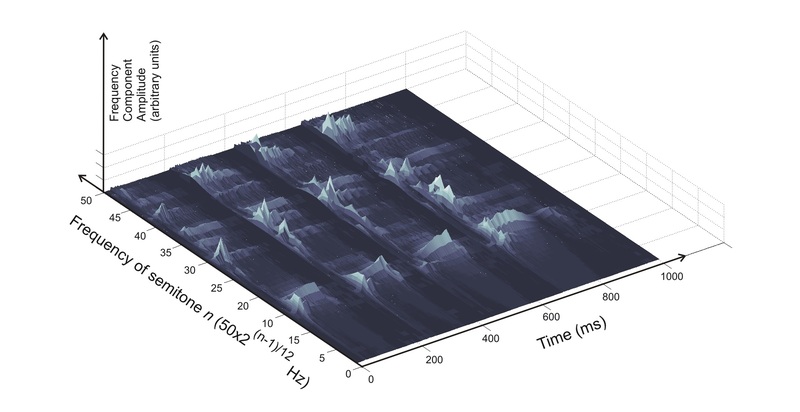 The intent of this study is not to realistically model the human auditory system, but to demonstrate a set of features an abstract and generic system should poses in order to produce the consonance pattern. Summary: Inner ear (cochlear) simulation research triggered the creation of this fast-calculation algorithm for a novel discrete resonance-based time-to-frequency transformation method. The presented stand-alone calculation algorithm related to this filter produces its output with a delay of just one sampling period. The algorithm’s calculation cost is only 3 multiplications and 3 additions per sample, and does not require long memory buffers. The presented transformation does not surpass the precision of the Discrete Fourier and Discrete Wavelet Transformations. However, it may prove essential when the noise-artifacts of the near-real-world simulation are necessary in order to produce some specific auditory-perception phenomena.